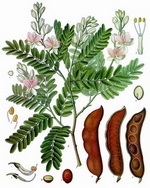 Tamarind is a member of the Fabaceae family also known as the bean family, botanical name Tamarindus indica and produces one of the world’s largest pods. The tree is a tropical evergreen which can grow to well over 80 feet, with small clusters of beautiful red striped yellow flowers. The pods are long and light brown in color containing 10 dark brown angular seeds surrounded by an acidic pulp, with an aroma that is sharp and fruity, and a taste that is said to be like tangy raisins. The tree is native to tropical East Africa. The trees grow wild in India and are also thought to be native to South Asia. The products can be purchased from spice shops, and Asian and Indian, Caribbean, and Latin American grocery stores. The concentrate of the fruit can be purchased in jars from 3.5 to 18 oz, as can be the paste which comes in similar size jars. The less common powder can be purchased also. The product should be stored in an airtight package to prevent it from drying out. The product is used as a souring agent for foods in tropical countries. The paste is used in Asian stir fries due to its high salt content.